This year's edition of FYF -- essentially Coachella's not-so-little sister, taking place Aug 27th-28th in Exposition Park -- boasts an impressive lineup of major acts including Kendrick Lamar and LCD Soundsystem. The fest has also upped the game with its food entries in recent years, and is continuing that trend with a bevy of the best restaurants in LA serving food this year on the field, as Thrillist can exclusively announce. 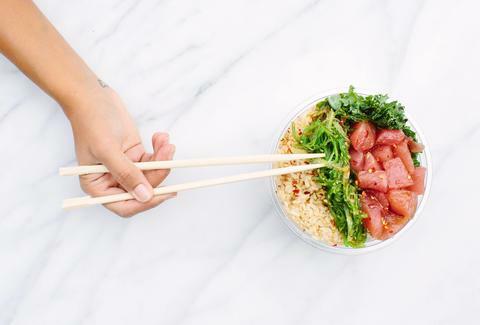 Major players include stalls from Koreatown's beloved Beer Belly (doing a take on topped French fries), bowls of sushi-grade fish from Mainland Poke, and the debut of Easy's, a burger concept from Alvin Cailan of Unit 120. Downtown's Ramen Hood will also be doling out noodles, Salt & Straw will be keeping the crowd cool with artisan ice cream, and Yeastie Boys will be making sandwiches on LA's best bagels. The recently revitalized Genghis Cohen will also be serving NY-style Chinese food, and dessert freaks will surely line up at a booth from Highland Park's Donut Friend. The full food lineup is below. In addition, the festival has announced that still-available-to-purchase VIP tickets will include expedited entry onto the field, as well as separate food stations, a VIP viewing area on the main lawn, and an on-site beer and cocktail bar. Jeff Miller recommends seeing Grace Jones and Air. Find him at the fest, or on Instagram at @jeffmillerla and Twitter at @ThrillistLA.